There’s a first time for everything! Even for attending a major event in Cannes. The problem is that once you take the decision to go, the pressure and costs immediately start to build up. If you’re attending the Cannes Film Festival, Midem or Mipcom chances are a lot of things are riding on your trip. A “good” Midem or festival really can catapult your business to a new level. So what should you know on your first trip to Cannes? I’ve often said that you need 2 or 3 trips to start really benefiting from the trade fairs. But don’t let that stop you from squeezing the absolute most mileage from this first time! Also available on Amazon FR, Amazon UK and Amazon DE.The first thing you must absolutely do is make up your mind about whether you are going – and why. It might seem obvious, but if you miss the early bird rate you could end up paying double for the walk-in rate! At the time of writing this, Midem’s early bird rate is €525 (plus VAT), whereas the walk-in is €900. That extra €375 could cover your hotel costs – that’s the sort of savings we like on Cannes or Bust. Once you’ve decided and paid your rate, what’s next? These days, a huge amount of preparing for your market takes place online. 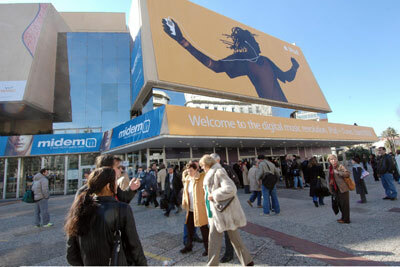 Midem, Mipcom, Mipim and the Film Festival all have online databases that you can access to find potential partners. In fact, some people sign up only to be in the database and to be able to use it. I’m presuming that if this is your first time in Cannes, you are not that high up on the pecking order. You have some great product and you want to start licensing it. You don’t need me to tell you who the major companies are in your sector. But the power of the database is in the details. Let’s say that you want to licence an album or film in a number of territories. My first reaction would be to single out the major territories and investigate them thoroughly. In this case, I’d check the major labels and distributors which you can sort by genre. You will then spend hours checking websites to see what these companies actually do. The online databases are handy, but I’ve noticed some people have tendency to tick all the boxes such as: “producer, DJ, distributor, label, rock, pop, classical, jazz, CD pressing, etc”. Euh, yes but what do they actually earn money from? So don’t trust the databases blindly, always check the websites. You will be matching these names against the market knowledge you have from reading the trade magazines. You do subscribe to at least one major trade magazine, right? You are then ready to start contacting these people. I will talk about the actual e-mail messages in a separate article. But bear this rule of thumb in mind: if you’re sending out exactly the same message to everyone, you are not doing your job right. People and companies can help in different ways. And I am still impressed by the numbers of people that respond to a direct question with some tips. But they have to feel you have something interesting and are not spamming the system. Don’t hesitate to move an appointment if you get a chance to sit with a major player. So you’ve picked up a few meetings, what next? Again, prioritising. You’re going to have meetings that clash. Don’t hesitate to move an appointment if you get a chance to sit with a major player. Most people won’t take it personally. But be quick to change plans. We’re getting closer to the date. Where to stay? I can still remember looking at the map of Cannes and being totally baffled by the choice. There are some 3,000 beds in the area. There’s no mystery: you can go either for location or price. Inside the “banana” carved by the viaduct that stretches from Le Suquet to Palm Beach is the easiest place to stay as you can walk to the Palais in between 10 and 25 minutes, depending on the location. Are you travelling alone or with a group? In the first case, you could easily save money and stay further afield in places such as Juan-les-Pins or Cannes La Bocca. If you want to use your accommodation as a mini-office (during the Film Festival or MIPCOM, for example), you are pretty much condemned to staying as close to the Croisette as possible). As the figures for all the trade fairs are down slightly over the past year, you can find accommodation for around €100 sharing. The apartment-hotels in La Bocca can sleep about three or four at incredible rates. For the most complete selection of hotels in Cannes, Juan-les-Pins and Cannes La Bocca, visit Cannes hotels. 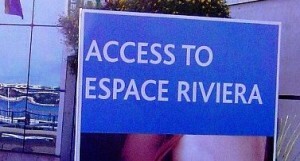 So what about getting to Cannes? There are really only two practical ways: by plane and by train. The nearest international airport is at Nice, about 45 minutes by car from Cannes. If you don’t rent a car, you will either take a taxi (count €90 to Cannes centre or check this article), take the high-speed coach (about €14 – great value) or take a bus (currently €1, but it takes about 80 minutes!). It is also possible to take the train. I’ll talk about this separately. People acclimatise to Cannes almost instantly. It’s likely that you will meet people in the flight already, and possibly in the coach. My advice is to try and find someone that knows their way around. Hook up quickly. When covering trade fairs, I often find someone that is not a competitor and offer each other tips, such as parties or receptions, or grabbing the cards of people that might be interesting. The other piece of advice is never to eat alone. Always find someone – no matter who – to share a sandwich or meal. They will introduce you to people (note: you’re supposed to return the courtesy). You can build up an interesting network quite easily this way. In meetings and conversations, always remember that English is most people’s second or third language. The Japanese, for example, are very cautious in what they say. Always have a business card handy. Remember to note the subject of the conversation on the back. Ten days from now, you’ll have a hard time remembering and might miss interesting leads. I’ve no particular tips for restaurants, as I only use one rule: go where people go. When leaving Cannes, check the last time for the coach, which is currently at 7pm! If people turn up too late, offer to share a taxi (and swap cards). Leave an hour to get to the airport, plus the time before checking in. Lastly, follow up diligently once you get back to your office. Otherwise, lots of those contacts will have been for nothing. For just EUR 7/under $10, get 17 years of experience that will enable you to get results from your very first trip to the Cannes Film Festival, MIPTV and MIPCOM, Midem or MIPIM. Learn how to plan, pitch and make your first trip to Cannes a productive one. You also get a promo code that offers a 10% reduction on studios and apartments in Cannes! Work out how much that alone will save you! For under $7, get 17 years of experience that will enable you to get results from your very first trip to the Cannes Film Festival, MIPTV and MIPCOM, Midem or MIPIM. I hope this article will have been of use. I’ll be adding to it over time, when I see what people are looking for. Keep up to date using the RSS feed, follow me on Twitter or why not get Cannes news straight to your mailbox. I cover Cannes, music and movie biz news. Great information! Thanks for your time! Hello! Well done. That was a interesting post. I would like to learn more about this particular subject. Will be in touch. Greetings from Holland. Thanks for sharing this amazing blog with us. Cannes is a very beautiful place to visit, my first experience in Cannes is also wonderful.